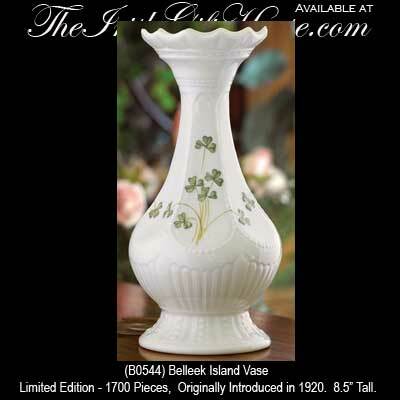 The fine china Belleek island vase features hand painted shamrocks. The Belleek Island Vase shape was originally developed with blank panels that could be hand decorated, often with flowers and other similar motifs. In the early 1920s, its middle panels were decorated with sprays of shamrocks. This form of decoration became the most lasting and remained in production until the mid 1990s. This Belleek island vase stands 8 1/2" tall and it features panels with green shamrocks. The fine Irish china vase is handmade and hand painted in Belleek, Ireland and it is gift boxed with a shamrock history card that is complements of The Irish Gift House. This reintroduction Belleek vase is limited to 1,700 pieces.